Pride in our traditional music compels us to “go out on the balcony”,… a place where you have to accept being seen, where you can no longer be private… and to start connecting with others. Catherine Planet spent four years in Louisiana where traditional music is embraced, and locals live their in public on their front porches. On returning to Montreal she missed these two social traits, and decided she’d do something about it. 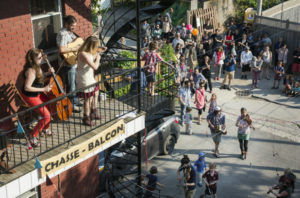 The result is a series of outdoor, free concerts called La Chasse Balcon, where musicians and dancers proudly bring their love of trad music to neighbourhood balconies, and invite anyone to join in. 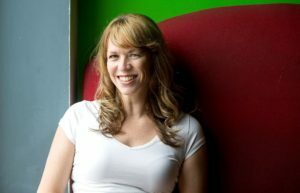 Catherine, herself a musician fronting the band Rose Vagabond,a catchy fusion of music from Quebec and Louisiana, is the inspiration and organiser behind the hugely popular movement. Following on from TradChat’s earlier introduction, Catherine reveals the background to how La Chasse-Balcon began, and the postive influence it has on everyone involved. Can you tell us what La Chasse-Balcon actually is? The Chasse-Balcon is a series of concerts presented on balconies. Four musicians play traditional Quebecois music and two dancers mingle with the public to attract a crowd. Each concert takes place once a week, in a different area of the city. The exact address of the balcony is never given. The public has to find it by following the clues given on social media a few days beforehand. These clues are often about the history of the district or street, the origins of the suburb’s name, the architecture, the works of art etc. I lived in Louisiana from 2010 to 2014, where I did a master’s degree on the cajun culture. I observed that there is a direct link between the traditional music of a people and social cohesion; to know your own traditional music and to have it as the background to so many festivities develops pride in a people’s identity. This makes people happier and more open to one another, less timid. It doesn’t matter that this music isn’t part of the entire population’s background. What’s important is that a majority identify with it and use it as a common bond with their neighbour. This is enough to create an atmosphere of camaraderie that everyone wants to join in with (tourists, immigrants etc). Some parts of Louisiana are also as well known for how much of their daily life takes place on their front porches. They will sit out there, greet friends, play music and do their cooking there. This creates a connection with neighbours and people around them. When I returned to Montreal, I missed these two social elements. So I’ve made an attempt to recreate this atmosphere in many different parts of Montreal, by combining traditional music with balconies. What’s more, “balcony” has always been a strong image for me. I associate the expression “go out onto the balcony” as an expression of self. Really, to take a step out through the door and onto the balcony is an act of going from privacy to being in the public eye. The balcony becomes a place where you have to accept being seen, where you can no longer be private. To do this, you have to be confident in yourself, and to continue to be yourself in public, to be able to say who you are, without fear of being judged by others. So in a social situation where I need a great deal of self-confidence, I say to myself, “Come on, Catherine, go out onto the balcony!”, which means, “Be proud of yourself, and just hurry up and get out there!” I have met many amazing people this way. This individual metaphor can be applied collectively too: the more a culture takes pride in itself, the more its people will “go out onto their balconies”, which in turn leads to a greater community spirit. Is all the music traditional Quebecois music? Yes, traditional music is an important part of the event. The Quebec Government would like to see the arts reflect the multicultural mix of its largest cities. So it’s much easier to get funding for an arts project if there’s a range of different cultures involved. This has led to the Quebecois sound becoming forgotten, or diluted with other styles. The result: the population and a very large majority of Quebecois musicians barely know anything about our traditional music, which makes it hard to increase its profile. So the Chasse Balcon aims to reclaim our music in its most complete form, ie the way in which it has naturally evolved over the decades and centuries right up until today. I noticed that your website has a list of tunes. Do the musicians have to choose what to play from this list? No, this list has been made to give credit to the composers or to musicians whose interpretation of a tune was used. It would be cumbersome to give credit to them during the event and would interrupt the flow, so that’s why there’s a list on the internet site. Also, for anyone who wants to join in and play at the concerts, the list of tunes and the link to the sheet music is there so they can learn the pieces in advance. It’s possible to join in the concert at ground level, on the stairs, or even on the balcony. This keeps the event spontaneous, which I think is an important and enjoyable part of traditional music jams. Are there tunes that are much-loved by the audience? The audience doesn’t know the tunes very well. This music isn’t heard much, it’s pretty much ignored by the media. Also, there’s a big generation gap: people over 50 were exposed to this music as kids because it was part of their everyday life, with their parents and grandparents playing it. Then the music disappeared from daily life, and young people were no longer exposed to it. So most people hardly know the pieces, apart from a few tunes popularised on the best-selling albums of La Bottine Souriante. Traditional Quebecois music is now only associated with New Year, with the sugar shacks or the National Day. It’s played more as a symbol of remembrance than just for enjoyment. Without knowing the tunes, it’s more difficult to latch onto the melodies and discover a style. That’s why the repertoire for La Chasse Balcon stays the same for the year. This allows the public who come back to another concert or who look at the video clips to become familiar with the tunes, to start humming along to them, and to associate trad music as an enjoyable moment in their daily routine. How do you find the locations? In 2 ways: 1. As a call to the public through social media, and people respond by offering us their balconies. 2. By scouting the districts for a suitable location and knocking on doors. It seems that La Chasse-Balcon is very popular and always well-received. Is this the case? Yes. At the start, I expected to have about thirty people at each one, but that quickly grew to 500! Despite the fact that we do the concerts between 5pm and 6pm, which is just too early for many people to make. A Radio-Canada report has been viewed more than 700,000 times and shared 13,000 times Hundreds of positive comments have been made on the facebook page, and many people are offering us the use of their balconies. Everywhere people are commenting how much they enjoy traditional music. The audience are multi-generational and multicultural. The dancing makes everyone mingle in together and chat to each other. This is way above my expectations, but correlates to my thoughts at the start: pride in our traditional music compels us to “go out on the balcony”, and start connecting with others. Would you say the Quebecois are proud of their music? I think so, yes, but only when they are given “permission” to express this pride (at New Year, in the sugar shacks, on the National Day). The rest of the time this pride is hidden, people are a bit embarrassed by it. For some Quebecois, it’s even associated with a political agenda, the separatist movement in fact, because of it’s link with the Quebecois identity. This explains why some people are keen to distance themselves from it. In short, no one is rolling out the red carpet for Quebecois traditional music, not Quebec itself, not the government, not the media. It’s hard land to cultivate, but a good portion of the population is getting involved and asking for more. Est-ce que vous pouvez décrire ce qu’est La Chasse Balcon? La Chasse-Balcon est une série de spectacles présentés sur des balcons. Quatre musiciens jouent de la musique traditionnelle québécoise, et deux danseurs dans le public entraînent les spectateurs. Chaque spectacle a lieu une fois par semaine, dans un quartier différent de la ville. L’adresse exacte du balcon n’est jamais donnée. Le public doit le trouver en suivant des indices divulgués sur les médias sociaux quelques jours auparavant. Ceux-ci concernent souvent l’histoire du quartier et de la rue, la toponymie, l’architecture, les œuvres d’art, etc. J’ai habité en Louisiane de 2010 à 2014, où j’ai fait des études de maîtrise sur la culture cajun. J’ai observé qu’il y avait un lien direct entre la musique traditionnelle d’un peuple et sa cohésion sociale : Connaître sa musique traditionnelle et l’avoir comme trame de fond de plusieurs fêtes développe une fierté identitaire qui rend une population plus heureuse, donc plus ouverte à l’autre, moins timide. Que cette musique ne soit pas celle de toute la population n’est pas grave; il s’agit qu’une majorité s’y reconnaisse et y trouve des éléments communs avec son voisin. Cela est suffisant pour créer une ambiance de convivialité, à laquelle tous les autres ont envie de se joindre (touristes, immigrants, etc.). Certains quartiers de la Louisiane sont aussi bien connus pour l’occupation de leur front porch. Plusieurs y sont assis, reçoivent des amis, jouent de la musique et cuisinent. Cela crée des liens avec les voisins et l’entourage. Quand je suis revenue à Montréal, ces deux éléments sociaux me manquaient. J’ai donc tenté de recréer cette ambiance dans différents quartiers de Montréal, en combinant musique traditionnelle québécoise et balcons. De plus, le balcon a toujours été une image forte pour moi. J’associe « sortir sur son balcon » à l’expression de soi. En effet, franchir le pas de la porte pour aller sur son balcon est un passage de l’espace privé à l’espace public. Le balcon devient donc comme une scène où l’on doit accepter d’être vu, où nous ne sommes plus dans l’intimité totale. Pour cela, il faut avoir confiance en soi, continuer d’être soi-même face à la société : avoir la capacité de dire qui l’on est, sans avoir peur du jugement d’autrui. Ainsi, dans une situation sociale où j’ai besoin d’une grande confiance en moi, je me dirai : « Allez, sors sur ton balcon, Catherine! », ce qui veut dire « Sois fière de qui tu es et fonce. » Cela m’a valu de nombreuses rencontres très enrichissantes. Cette métaphore individuelle peut s’appliquer à la collectivité : plus un peuple est fier de lui, plus il « sort sur son balcon », plus son esprit communautaire se développe. Est ce que toute la musique traditionnelle est québécoise? Oui, il s’agit d’un élément important du spectacle. Dans l’esprit pluriethnique des grandes villes du Québec, il y a une volonté gouvernementale d’encourager le métissage des arts. Il sera donc toujours plus facile d’obtenir des subventions si un projet artistique ou médiatique mélange différentes traditions culturelles, et si on y entend des sonorités multiethniques. Or, dans ces efforts de mixité, la sonorité québécoise est soit oubliée, soit toujours mêlée à d’autres styles. 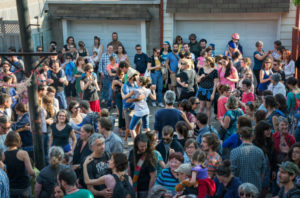 Résultat : la population et une très grande majorité de musiciens québécois ne connaissent absolument rien de notre musique traditionnelle, ce qui rend son rayonnement très difficile. La Chasse-Balcon vise donc la réappropriation de notre musique dans sa forme la plus complète, c’est-à-dire de la façon dont elle a évolué naturellement à travers les siècles et les décennies jusqu’à aujourd’hui. J’ai remarqué qu’il y a une liste de répertoire sur le site. Est ce que les musiciens choisissent à partir de cette liste? Non, cette liste a été faite pour donner du crédit aux compositeurs ou aux musiciens de qui la version a été prise. Donner ces crédits lors du spectacle serait laborieux et couperait trop souvent le rythme, d’où la raison de cette page internet. De plus, la liste du répertoire, et les partitions qui sont en lien, permettent à quiconque désire se joindre au spectacle avec son instrument d’apprendre quelques morceaux à l’avance. Il pourra ainsi se joindre au spectacle à partir du public, dans les marches ou même sur le balcon. Cela conserve le côté spontané que je trouve important et amusant dans les jams de musique traditionnelle. Est qu’il y a des morceaux communs que l’audience reconnaît? L’audience ne connaît pas beaucoup les morceaux. La musique traditionnelle est pratiquement absente des médias, donc très peu entendue. De plus, il y a eu une grande coupure entre les générations : les personnes de 50 ans et plus ont été exposées à cette musique étant petites, car elle faisait beaucoup plus partie de leur quotidien, de par leurs parents ou grands-parents qui en jouaient. Puis, elle a disparu du quotidien et les jeunes n’y ont plus été exposés. Ainsi, la majorité des 50 ans et moins ne connaît pratiquement aucun morceau, à part quelques airs popularisés par les albums les plus vendus de la Bottine Souriante. La musique traditionnelle n’est maintenant associée qu’au jour de l’an, à la cabane à sucre ou à la fête nationale : elle est utilisée comme devoir de mémoire plutôt que par plaisir. Sans reconnaître des morceaux, il est plus difficile de s’attacher à des mélodies et de découvrir un style. C’est pourquoi le répertoire de La Chasse-Balcon demeure le même pendant une année. Cela permet au public qui revient ou qui regarde les vidéos de reconnaître des morceaux, d’en fredonner les airs, et d’associer la musique traditionnelle à un moment joyeux de leur quotidien. Comment est ce que vous choisissez les endroits? De deux façons : 1) Un appel à tous est lancé dans les médias sociaux, et les gens nous offrent leur balcon. 2) En faisant du repérage dans les quartiers et en cognant aux portes. Il semble que La chasse Balcon soit très populaire et reçoive toujours une bonne réaction du public? Oui. Au départ, je m’attendais à avoir une trentaine de spectateurs chaque fois, mais rapidement, nous en avons compté jusqu’à 500! Et ce, en faisant des spectacles de 17h à 18h, ce qui est trop tôt pour plusieurs personnes. Un reportage de Radio-Canada a été vu plus de 700 000 fois et partagé 13 000 fois. Des centaines de commentaires positifs sont faits via la page Facebook et plusieurs personnes nous offrent leur balcon. Les références au plaisir de la musique traditionnelle sont omniprésentes. Le public est multigénérationnel et pluriethnique. Avec la danse, tous se mélangent et se parlent. Cela est bien au-dessus de mes attentes, mais répond à mon hypothèse de départ : la musique traditionnelle est une fierté qui nous pousse à « sortir sur notre balcon », qui crée des liens. Est-ce que vous pensez que les québécois sont fiers de leur musique traditionnelle? Je pense que oui, mais seulement quand on leur donne le « droit » d’exprimer cette fierté (au jour de l’an, à la cabane à sucre et à la fête nationale). Le reste du temps, ils camouflent cette fierté, ils en ont « honte »… Certains Québécois croient même que la musique traditionnelle, puisque identitaire, est associée à une partisannerie politique, voire à la souveraineté du Québec. Cela explique leur volonté de s’en dissocier. Bref, le Québec, l’aide gouvernementale et les médias ne déroulent pas le tapis rouge à leur propre musique traditionnelle. C’est un terrain difficile à défricher, mais une bonne partie de la population suit le mouvement et en redemande.